1. On lightly floured surface, roll pastry to 12-inch circle. Place in 9-inch pie plate. Turn under edge; flute. Mix milk, MUSSELMAN'S Apple Butter and pumpkin puree by hand until smooth. Add the pudding mix and stir until well combined. Add sweetened condensed milk and stir until smooth. Fold in whipped topping. 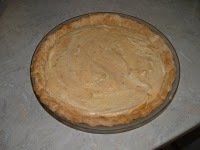 Pour mixture into pre-baked pie crust (bake according to package) or pre-made graham cracker crust. Refrigerate until ready to serve. My son did this recipe back in 2008, if I remember, when he did this recipe he added the whole can of sweetened condense milk. It still turned out really good. We always try to make this recipe at Thanksgiving. The ingredients and directions where copied from the web site where this recipe came from. Clicking on the pic should take you to the web site. Thanks for posting the recipe. I am always on the lookout for new ones. Sounds yummy! That would be one sweet pie with the whole can of milk! Thank you for linking your wonderful recipe to Fat Camp Friday. I would also love for you to join my new forums and link up your website and any linky parties you host! Have a great weekend!